Cycle World magazine recently hailed the KTM 1190 Adventure as the “best all-around bike in the world”. While this is certainly a bold statement, there’s no doubt the new orange beast is an incredible machine on the road and off. When the AltRider design team began developing accessories for the 1190 Adventure, we knew our parts had to live up to its rugged capability. Ground clearance, cornering ability and maximum protection were the highest priorities with the newest AltRider skid plate. 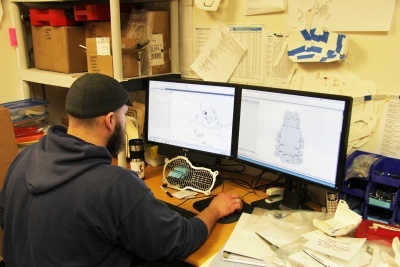 When the engineers at AltRider design a skid plate, mounting locations and brackets are always the first step. This is the foundation for a strong system that can take BIG hits. The mounts also determine how low the skid plate hangs under the bike. Most impacts occur on the front of the skid plate while the bike is travelling in a forward direction. When the front takes a hit, it creates rotational forces that actually put an incredible amount of force on the rear brackets. In order to prevent that force from being transferred to the motor, we designed the rear brackets to rely on the frame as much as possible. The bracket is bolted to the frame behind the foot peg mount. This ‘sandwiched’ design is incredibly strong but still susceptible to tweaking from hits from directly below (i.e. landing on the skid plate). So we also tied into the massive M10 engine mount bolts creating the only system on the market to tie into both mounts in the rear. The rear mounting brackets also feature a unique keyed design which further increases their strength and ease of installation. This mounting system provided a surprising challenge. 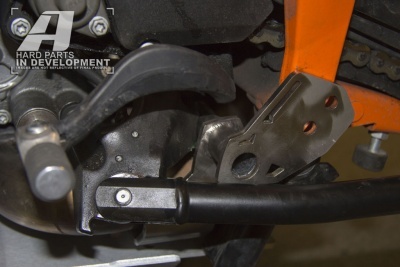 Between the 2013 and 2014 model year, KTM stopped threading the rear engine mount on one side. 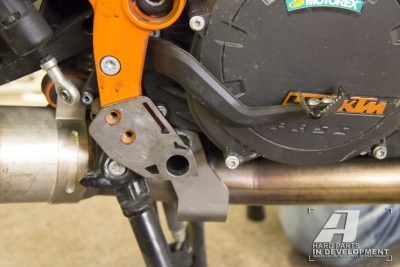 The problem is, they neglected to tell their own dealers even though the OEM KTM skid plate required a threaded engine mount on both sides for installation. The official fix had dealers busting out a tap and threading those holes themselves. 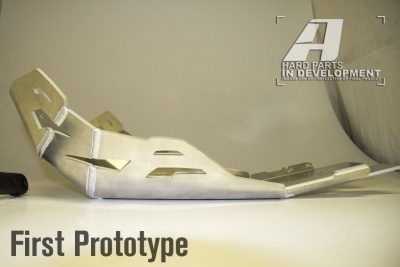 Not satisfied with this solution, the AltRider engineering team developed a separate bracket specifically for the 2014+ models. 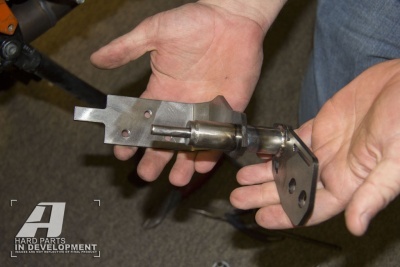 By using a non-threaded insert that’s precision machined to the exact size of the hole, the design still benefits from the added strength of the mounting location without the need for a messy or dangerous drilling and taping of your expensive engine. The design of the rear brackets also serves to reinforce the KTM’s side stand. The mounting location of the side stand makes it incredibly vulnerable to snags on rocks or other trail obstacles. On 2013 models the side stand is mounted to the motor and tied in to the frame, while on 2014 models this frame mount has been removed and the side stand is affixed solely to the motor. A hit to this mount could seriously damage a motor and ruin your ride. The rear bracket of the AltRider skid plate passes through the side stand mount on both models -- greatly reinforcing the side stand strength by securing it to the frame. To provide maximum protection, we expanded the sides of the first prototype to fully protect the side stand mount from forward hits. The new design provides extraordinary coverage and eliminates the need for the costly and heavy parts found in aftermarket side stand relocation solutions. The skid plate protects the entire motor, including the clutch pack and stator. The AltRider plate is constructed from 3/16” anodized aluminum that can take a serious beating while still maintaining a light weight. 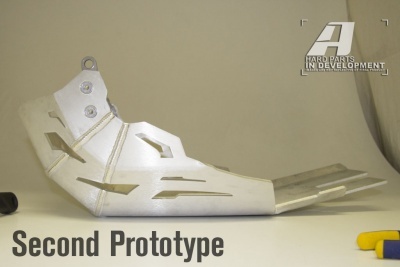 The AltRider skid plate for the KTM 1190 Adventure is available in 2 beautiful options of anodized silver or black. All surfaces are grain finished to remove any tooling marks. Click here to order yours today.